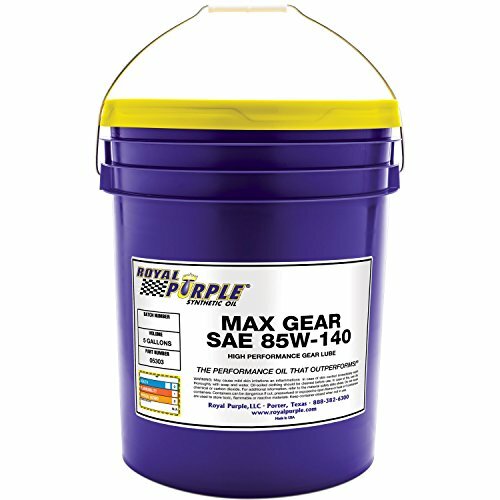 Royal Purple 05303 Max Gear 85W-140 High Performance Synthetic Automotive Gear Oil - 5 gal. Max-Gear is an ultra-tough automotive gear oil. It's designed to maximize power and provide unsurpassed protection to heavily loaded gears. It makes gears run smoother, quieter, cooler and longer without overhauls. Max-Gear outperforms other gear oils because it combines the highest quality synthetic oils with Royal Purple's proprietary Synerlec additive technology. Max-Gear is recommended for use in truck, motor home/RV and automotive front or rear differentials, manual transmissions, and lower gear units of marine engines that specify use of an API GL-5 or GL-4 fluid. All viscosities of Max-Gear are formulated with hypoid friction modifiers necessary for use in clutch or cone type differentials. No additional additives are necessary.